Help! It’s a Business Process Diagram! 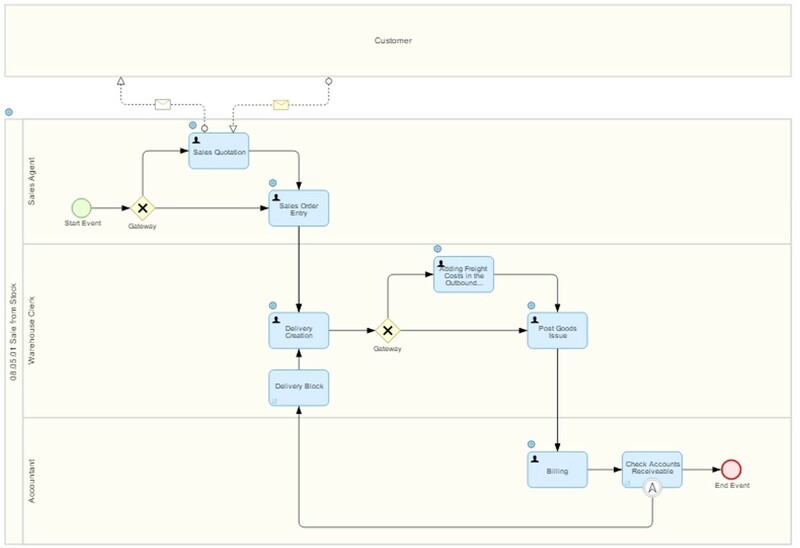 When I got my first look at a new SAP Solution Manager 7.2 business process diagram, I had to overcome an initial mild shock. Do you know the feeling when a kindergartner offers you their crayon drawing to review? Maybe you cautiously accept the color-scratched paper. Maybe the miniature artist stands by with a wide-eyed stare, impatient to discuss all the graphic representations . . . But then something begins to happen. With me, I could see how that business process diagram was uncluttered. I followed the flow of soft blue rectangular step icons, and breathed a sigh of relief. So too, if you perhaps recognize the kindergartner’s attempt at a stick figure. That lopsided box with the triangle on top is a house, of course! And in the upper corner, a smiling sun makes perfect logical sense for the pleasant day portrayed. Whether or not you’re dealing with representations of complex concepts, SAP Solution Manager’s graphical processing editor can still manifest a seemingly-overwhelming number of diagram options. Beyond following the flow of basic process steps, I had to reference different building concepts and particular icons. After all, modeling applies to specific internal aspects of a business such as fulfilling a purchase order. Unfamiliar icons, even when imbedded in familiar process steps, I found important to decipher because they still impact the diagram’s meaning. Also, modeling shows businesses ways to optimize their collaborative relationships. From deciphering available icons in the graphical editor palette to using BPMN to understanding types of processes, I found getting a first look at the graphical process editor’s documentation could ease any difficulties with (in)artistic interpretation.